Then the Lord hardened the heart of Pharaoh, king of Egypt and he pursued after the Israelites, although the Israelites were going out boldly. Then the Lord hardened the heart of Pharaoh, king of Egypt: Several changes have occurred between verses seven and eight which need to be discussed. Pharaoh will have received by now additional information about the Israelite movements correcting his original impression of verse five that they had departed into the desert. Now he discovers that instead they are indeed still in "the land" after all. It is at this point that Pharaoh goes through the reasoning process of verse three according to the Lord's prophecy (i.e., assuming that they have been precluded from escape by the desert, according to his erroneous analysis). We know that this faulty thought process precedes the events of verse eight, because in verses three and four, God's prophecy placed the hardening in sequence after it. So first Pharaoh receives the new information (the report of the spies; see verse five above) that leads him to the false conclusion that the Israelites are demoralized and trapped (by the desert). Then God hardens his heart, that is, allows him the psychological leeway to act on his desire, blotting out in his thinking the awe-inspiring disasters recently leveled on the Egyptians because of just such stiff-necked behavior on Pharaoh's part. (2) the false report came in from his spies, encouraging him by making him believe that the Israelites were demoralized and trapped (and assume too, it is certainly implied, that God was not powerful enough to deliver them after all). (3) Finally, God hardens Pharaoh's heart to enable him to pursue, so that God's true power and glory will be made manifest in the spectacular events at the Red Sea. 1. If Pharaoh were only interested in maintaining the Israelites as slaves, then a rapid, military pursuit of this sort would have been unwise, since they had not yet overstepped his permission in their journeying (see on verse five above). Even after the initial stage of the pursuit, moving against the Israelites in battle formation (as he did; see on verses ten and eleven below), an act which, without the Lord's deliverance, could only result in their destruction and not their recapture. This behavior was antithetical to his originally implied purpose of keeping them alive as vassals (see on verse five). 2. The text gives no indication whatsoever that Pharaoh attempted to parley with the Israelites once he overtook them at the Red Sea. If his purpose were to bring them back north, the only sensible course would have been at least to have given them an ultimatum to that effect rather than moving to attack them immediately as he did (verses ten and eleven). The enemy said I will overtake, I will divide the spoil; my desire shall be gratified against them, I will draw out my sword, my hand shall destroy them. Destruction, not recapture, was clearly their objective and intention. And the Egyptians pursued after them and overtook them camping by the sea (all the horse-chariots of Pharaoh, along with his cavalry, that is, his entire force did so) at Pi-hahiroth before Baal-zephon. And the Egyptians pursued: The Egyptian force has followed Pharaoh without complaint, but it is likely that the rank and file has not been briefed on the ultimate purpose of their mission, that is, Pharaoh's intended destruction of Israel. Given the awe-inspiring plagues just recently rained down on them and their countrymen, it is not surprising to learn that they too will need to be "hardened" before they are willing to follow Pharaoh's orders to attack (see on verse seventeen below). This is in spite of the fact that they are an elite group serving under hand-picked officers. and overtook them: Visual, not physical contact is meant. This is made clear in verse twenty which shows that the two camps were separated by what must have been a significant distance. 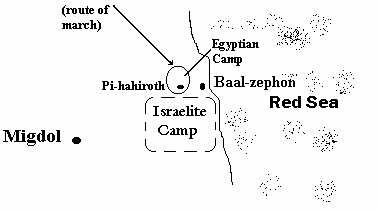 camping: The Israelites were already in the position that had been indicated to them by the Lord in verse two. his entire force did so: Pharaoh's entire mobile force reached the objective intact. 1. The description at Pi-hahiroth before Baal-zephon actually occurs after the lengthy parenthesis describing the Egyptian force, so that it is most logical from a (Hebrew) grammatical point of view to assume that this is because it is a description of the Egyptian position. 2. That there was a significant distance between the two camps is clear from verse twenty, where the pillar of cloud and fire is said to move between the Israelite and the Egyptian bivouacs. 3. It is stated clearly in verse two that the Israelites are to camp before Pi-hahiroth, between Migdol and the sea. However, the description in question here is of a force located actually at Pi-hahiroth (Hebrew 'al in contrast with the liphney, "before" or "facing", of verse two). Now when Pharaoh had entered the vicinity, the Israelites lifted their eyes and beheld that the Egyptians were about to move out after them. So the Israelites were very frightened and they cried out to the Lord. Now when Pharaoh: The word order in the Hebrew here (a disjunctive clause) here acts as a transition to shift the focus of attention now away from the Egyptian point of view to that of the Israelites. and beheld: Literally, "and behold! "; this Hebrew idiom vividly describes the shock they felt when they first saw the Egyptians bearing down upon them. 3. Lastly, Pharaoh and his commanders would need some time to observe the Israelite camp and determine on a specific plan of attack. So Israel's shock comes not from the arrival and encampment of the Egyptians (a large mobile force of this type would have at the very least raised a massive dust cloud visible for many miles and hours in advance), but from their surprise, disbelief, and fear at the battle preparations which the Egyptians were making. The most likely interpretation of the situation here is that the Egyptians had begun to "move out" in the sense of exiting their camp and drawing up in a formal line of battle (but God would intervene before they were able to carry out their plan of attack). In this way, the Israelites have come to share the secular viewpoint of Pharaoh who assumes that God has abandoned Israel at last and that they are now finally at his mercy. Just like Pharaoh, they have too effectively forgotten the lesson of the plagues and God's mighty deliverance of them only days before. Only Moses keeps his head, his faith, and his confidence in the power and faithfulness of the Lord. 1. "The 'high hand' is properly the hand uplifted to deliver a blow." B. Childs, The Book of Exodus (Philadelphia: Westminster, 1974) 225. 2. Y. Yadin, The Art of Warfare in Biblical Lands (New York 1963) 104. 4. J. Lange, Commentary on the Holy Scriptures (Grand Rapids 1960) Exodus, 49.